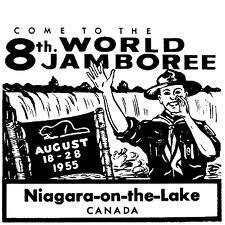 From August 18th till August 28th in 1955, over 11,000 scouts from 71 countries gathered in Niagara-on-the-Lake for the Eighth World Scout Jamboree. It was the first major international gathering of Scouts outside of Europe. In 1955 the local Scout lodge stood on the present site of the Shaw Festival Theatre, and Parliament Oak School was turned into a hospital by the Department of National Defence. Seventy-five hundred tents were set up on the Commons in the old town. Governor General Vincent Massey opened the festivities, and Lady Baden-Powell addressed the assembled gathering. It was a historic gathering that was commemorated by a Canadian stamp to mark the occasion. There was one uninvited guest however, Hurricane Connie passed through Southern Ontario five days before the event and created major havoc. In typical Canadian fashion, volunteers showed up in great numbers to restore the site, so many in fact that some had to be turned away. It was the Grand Jamboree, “~the Eighth World Jamboree~” the “Jamboree of New Horizons”. For a few days, the participants would indulge in the comradeship of a World Jamboree. There were friendships made that would last a life time. The Canadian Boy Scouts Association (it wasn’t Scouts Canada back then) had made sure that all physical needs such as food, tours and programs were available. 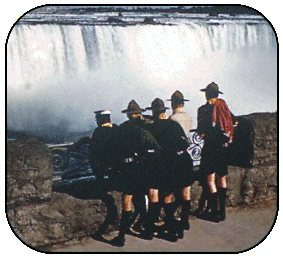 But it was the Canadian Scouts themselves who provided the setting for the ‘Scouting Spirit’ that would be talked about for many years to come. The event was impressive, with eleven thousand Scouts (11,000) meeting for the first time at the opening ceremony. The campfires, the visits to camp sites by Scouts from other parts of the world, the rubbing of shoulders and the exchange of addresses, all contributed towards the fellowship fostered at the camp. Bert Wilson, of Northern Ireland contingent, at a recent 50th reunion said: “We made friends from many countries, and we put on shows.” The Belfast and County Down scouts formed the basis of an Irish dancing team. Fumio Ishida of Japan, whose patrol was named the Hudson Bay Patrol said, “It was a really big deal to come to the Jamboree. Not many from Japan went abroad in those days. It was only ten years after the 2nd World War and we were a poor country at that time. We lived on hot dogs and Coca-Cola” Fumio explained. Claude from Canada and Jonas from West Africa who had corresponded for several years after the Jamboree eventually lost touch with one another. Claude became Professor of Environment at the Polytechnic of Montreal while Jonas became a literature teacher in high schools and college in Côte d’Ivoire, West Africa. Years later during a trip to Montreal Quebec Jonas found and met with his old friend. The meeting was made possible as a result the research done to locate Claude by three fellow Scouts, Guy Leduc, Jean-Guy Leduc and Lise Morency. Claude’s and Jonas’ reunion was a beautiful testimony of international friendship. Two years after the 1955 World Jamboree, Scouting would be celebrating its fiftieth (50) anniversary. By then the Eighth World Jamboree would be history, but the comradeship nourished by the event had been spread to all corners of the world and deepened spirit of the scouting movement. Looking into my ‘rear-view mirror’ I see the pride of accomplishment that Canadian Scouting and its core of the Volunteers felt as a result of making this event a reality. We in Scouting were handed the torch to ensure that fifty years henceforth the flame was still burning bright. If old Scouter’s could take a look in Poppi’s ‘rear- view mirror’ they would see our linked arms and huge smiles on our faces. We can all take pride in knowing we made a contribution towards creating the largest youth movement in the world.